So this lipstick officially has the longest name ever! However to its credit it does quite literally sum it up; it is brilliant and perfect, and it does deliver a sheer shine! So Clarins, you’re forgiven for the mouthful. The two shades above, Tropical Pink and Coral Tulip have been launched as part of the new (ish), limited edition Clarins Opalesence Spring 2014 Collection, and the shades are bright, juicy and glossy – perfect for your beach bag! The shades have a more sheer finish compared to the original Joli Rouge Lipstick formula, and have the texture of a luxurious lip balm when you apply them. The lipsticks one is an expensive looking silver barrel, which has a hugely satisfying *snap! * when you close it – simple things! 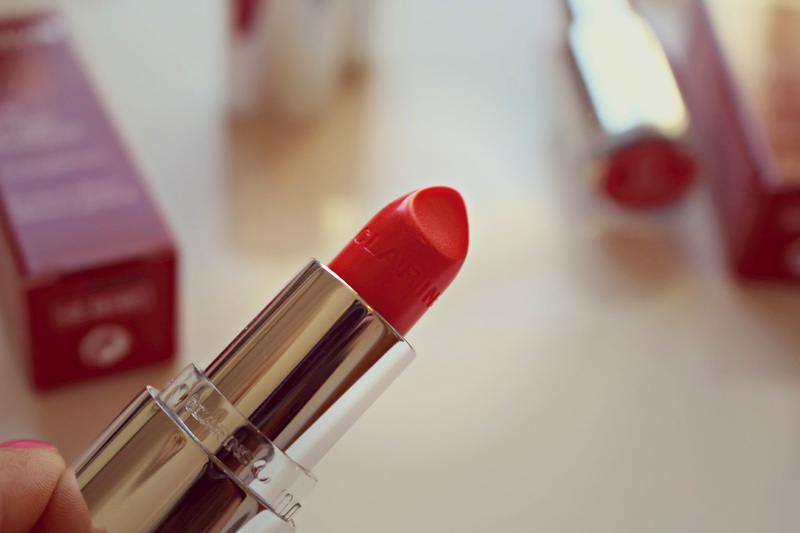 The lipsticks give a smooth translucent colour, and feels very moisturising as you apply it. I had to reapply every couple of hours – this kind of texture never sticks around for long – but it is such a pleasure to apply that I don’t even mind. As it is sheer, you can also wear it over a similar lipstick colour for a more intense shade, and despite the glimmering lipstick, there’s actually no shimmer or glitter on your lips, but instead just a fresh, tropical glimmering effect. I absolutely adore the fruity fragrance, and they even have a slight taste. I don’t mind this, but sensitive wearers may want to test out first. 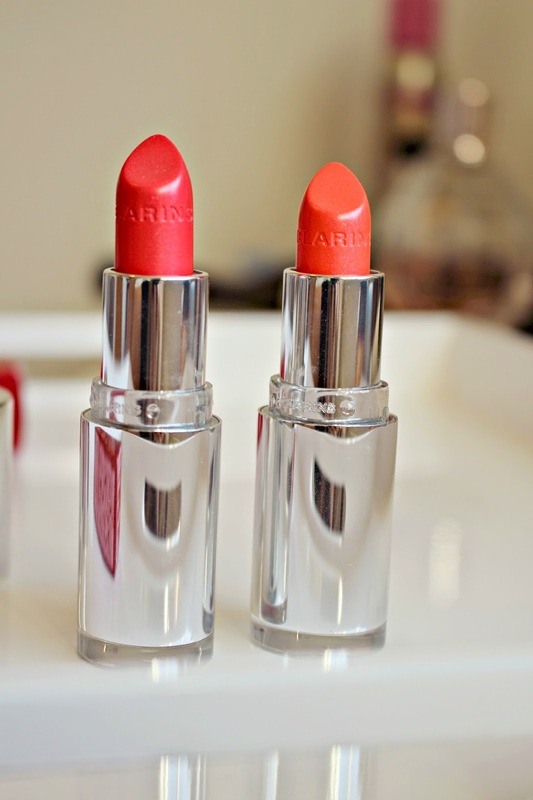 My favourite shade is Coral Tulip (right) and i’ve been wearing it almost every day. 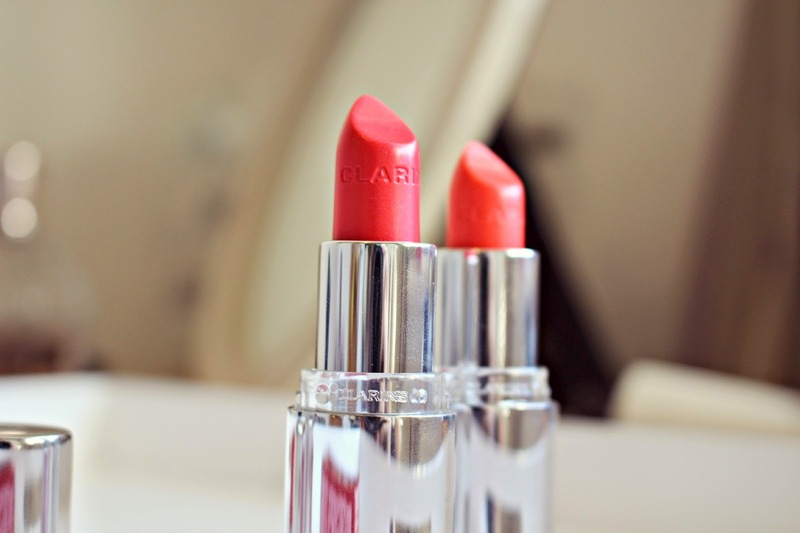 It took something quite special to drag me away from the Topshop Lip Crayon i’ve been loving (review here) but I just can’t resist the glossy, balmy, tropical fabulousness of the Clarins. The shade is a very wearable coral, if you want some colour but not the full bold matte shade, where as the lipstick on the left, Tropical Pink is a refreshing red-pinky shade for a more classic look. Overall, these shades are super easy to wear, and the juicy tropical shades just look fantastic with a tan, so if you are looking for some holiday makeup, or want to start adding some colour to your makeup routine, then I’d definitely recommend that you give these a try!